Jamie (very) early this morning on LiveDomainer.com who, by the way, is doing a great job, answering questions about domaining to newbies, as well as giving another space for domainers to meet up and discuss …Domains (of course! )..all this in a live video chat. This must be a gruelling job to be staying up in front on the laptop for such long hours..
We obviously talked about theBESTSintheworld.com and he gave me his impression about the concept. He opened my eyes to something I didn’t think of! 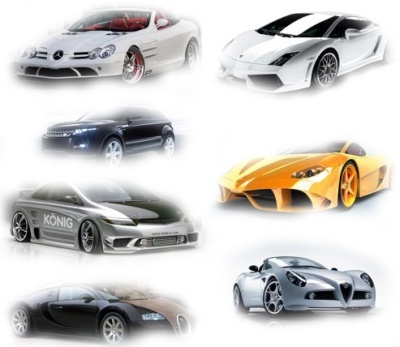 When he checked ‘the best CAR in the world.com’ , he was agreeably surprised to see the result. He found the car amazing but more interestingly, … he’d never heard of the brand itself!.. Well now, that came as a surprise to me! It is quite a well known brand in Europe! When I ask people around me what is the best car in the world? I almost always get that brand as answer. I thought it was well known all over the world, but apparently not. This gives some more weight to the concept. We will have some of our domains forwarding to websites that would be well known, giving the concept credibility, as well as some websites that would be relatively unknown but provide such high-quality products that we feel it’s our moral duty to tell the world about them. In any case, there will always be someone discovering something new! ‘the best HOLIDAY in the world.com’ ? After reading Julia’s post which eventually geared me towards this article on the Register, I was annoyed to read the comments of some readers. I strongly felt I HAD to clarify some things, so I commented too. It is hard to take in comments like the one made by Ron Green. But I guess this is how we, domainers, are seen from the outside world . (Yes, it is an outside world if you are not into domaining). It’s the harsh truth. I am tired of people associating domaining with cybersquatting . Domainers need a re-branding. An urgent one. You can start right now, it’s not going to be easy, but I believe it can be done. we would all be winners. I will defend domainers everytime I read/hear BS* about this community. ..that no stupid domainer is going to register domain names associated with the death of the soon-to-be (maybe) president of the united states’ grand mother. Trying to profit from such events is wrong. And those who do are sad people who will never succeed. My sincere condolences go to the Obama family on the recent passing away of Madelyn Dunham (grand mother of Barack Obama). She played an important role in Barack Obama’s life and she surely has contributed to shape somehow the character of the next president. Americans, vote wisely tomorrow. Your vote will have an impact on the whole world, not just the USA. PS: I will be closing the poll at thebest PRESIDENT intheworld.com tomorrow. I am ecstatic,.. having just saw one of the coolest ads on TV for a long time. It just grabbed my attention for the full 1 minute it lasted. A man speaking fast about all we do with our phones,..
‘my phone knows everything about me’ .. The ad ends with NO mention of which brand it is promoting. It simply ends with 3 domain names. What a call to action!! Wonderful. Bravo to them. Well done! This reminds me of another blog post I made some months ago. some more proof that call to action names are getting bigger. For those who have not noticed it, the website on JoeThePlumber.com has just been revamped. It now sports cool rounded edges giving a feel of web 2.0. But the contents have more or less stayed the same. Some reported the site got ‘Un-President-ed’ spike in the number of visitors ! The owner, flooded with hundred of thousands of emails and calls, and being offered 6-figures for the domain! It doesn’t seem like he sold..
Then, charge $100 to appear in a listing of plumbers by State! I’d require 10,000 plumbing companies/plumbers to sign up (that’s about 200 plumbers for each state) to make a cool million. I get to keep the domain name. think about it.. hundred of thousands (millions?!) of people know, have heard of, or have visited JoethePlumber.com recently. Where else would they go look for a plumber when they happen to need one? at that point in time, JoethePlumber.com was worth more than plumber.com .. He should have capitalized on this, out of the blue, traffic burst..
Strike while the iron is hot!.. oh wait.. that’s what joe the blacksmith would have done.. I just read an interesting article from Ron Jackson’s DNJournal about NBC’s plans to use NBC Geo domains in the near future. Have a read for yourself here. It would be interesting to know how these plans would affect GeoDomain owners like Chicago.com. Would it be tough competition, or as David Castello thinks, may work in GeoDomain owners’ favour? ..But this is not the point of my post today. In that article, a domain name (NBCConnecticut.com) was mentioned and while reading that, I dearly hoped that the NBC people have been smart enough to have got the NBConnecticut.com as well. 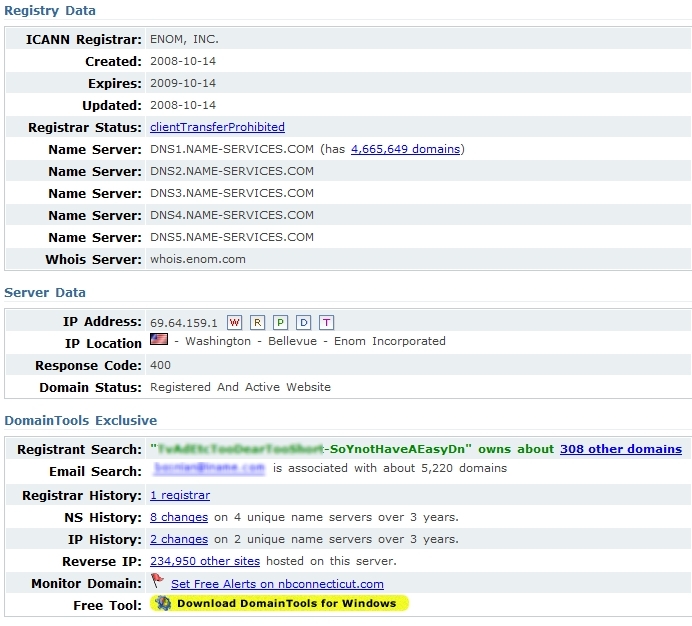 When I checked the whois records for the typo version,(NBConnecticut.com) I found that it was registered on the same date the article appeared on DNJournal, which would suggest that it had been available for the NBC people to get it when they made their plans. Like Elliot described in this post, I have often been in similar situations when I try to explain what I do. Typosquatting is seen as cybersquatting, so I hope the new owner of NBConnecticut.com realise what he/she is doing. The United States presidential election 2008, scheduled for Tuesday November 4, 2008, will be the 56th consecutive quadrennial United States presidential election and will select the President of the United States. There has been massive media coverage (as expected) throughout the whole world. The decision of the Americans will have an effect on everybody else’s life. So, vote wisely! Next month – in exactly 30 days- we should know the results at this time..